I have been composing music for years but it was mostly intermittent and studying music theory. Now it is more regular. I have written pieces for solo piano, which I find easy because I am a pianist and I know my limits when it comes to speed and intervals(16ths at 120 bpm and I feel the burn from the note speed being 4x the tempo, octave is the largest comfortable interval I can play, though I do occasionally stretch to a 9th and I have noticed slow progress with 9th intervals(before, I couldn't play them at all, now I can play them occasionally especially with certain keys, but if a piece is riddled with 9th intervals, instead of stretching for every one(some I can't reach at all and I obviously don't want to injure my hand), I might like stretch for a few and do a pedaled arpeggio for the rest)). I have written pieces for quartets which again, I find pretty easy because it is 1 family of instruments so I don't have to worry about clashes. Oh, so like 1 cello has a more melodic role than the other, so I might do alberti bass for the first cello and then longer notes like quarter notes in harmony with the alberti bass for the second cello. Should I have a brass corale? How am I going to deal with the timbres of the instruments I use and avoid clashes unless I want to add drama(as if the key wasn't making it dramatic enough)? Should I have the flute(or whatever instrument) at forte or is that too much? After all, different instruments have different amplitudes at the same dynamic, not just by pitch but also from 1 instrument to another at the same pitch. Will writing for harp be like writing for piano with just a few tweaks? So, how can I do this, writing my first symphony? I don't have access to orchestral musicians(nearest orchestra is I don't know how far, farther than my college though) and no matter how much research I do on the instruments or how many orchestration books I read and videos I watch, or how many pieces I have composed and how complex they have been, I still feel like I have to climb a huge mountain by myself with no equipment. I know, tons of composers have done this before, some even at young ages(such as Beethoven and Mozart). And Haydn wrote more than 100 symphonies in his lifetime. But for a solo pianist who has only heard orchestral pieces, never written them, it feels super intimidating. Not only am I dealing with multiple melodies but multiple timbres as well. When I feel like listening to a symphony, be it for inspiration or just to listen to it, I gravitate towards Beethoven, particularly his 5th symphony. Beethoven like brings me into the zone. Yes I may listen to Bach's fugues to see how Bach used counterpoint. Yes I may listen to Mozart when I am very emotional. Yes I may listen to Chopin when I am bored or to see how much emotion can come out of a single instrument(don't get me wrong, Beethoven also is very emotional in his piano works). But if I want to feel like I am in the zone or in my own world to either help me do my schoolwork faster or do something creative, I listen to Beethoven. Years ago my inspiring composer was Mozart. I just found it so beautiful and the complexity of the piece being in simplicity unbelievable. It sounds so complex and yet I look at the music and it looks simple. Now my inspiring composer is Beethoven. Beethoven inspired me to compose my first piano sonata and it also made me wonder "What is it about Beethoven that brings me into the zone? What is Beethoven's style? I am thinking of doing sort of a neo-Beethoven, my own style but clearly inspired by Beethoven." I find that Beethoven's middle works are really where most of his pieces(such as his symphonies) blossom but his sonatas blossom early on, even his first sonata sounds just as much like his style as his 8th sonata or his 14th sonata. 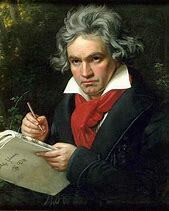 I often reference a Beethoven piece when I am writing a sonata or trying to write a symphony. So for my first symphony(first complete one anyway, I did try to write a symphony years ago and felt like maybe I wasn't ready and maybe I should write sonatas first), I would reference for example the rhythm of the Fate motif or the pizzicato strings in bars x-y of z movement or the first entrance of a particular instrument or the grand pause before the second theme of the first movement where no instruments are playing for an entire measure before ending on a chord and the second theme starting. It is like with Beethoven, he takes the length of a single theme to extreme length and has like sub-themes if you can call it that. I see this but to lesser extent in his sonatas. So anyway, I have listened to Beethoven's 5th so much that I have a lot of the symphony memorized in my head and can like hum the entire first movement. I can even play the piano transcription, though the full speed is only with hands separate. But even this still doesn't really help me in this situation. I have a clear goal in mind(a Beethoven-inspired symphony that still sounds like it is my style and not that of Beethoven), a clear set of instruments(Pretty close to what Beethoven used in terms of instrumentation), a clear starting key, lots of music theory knowledge, lots of instrument knowledge, lots of free orchestration resources, but feel like I don't even know where to start despite all this and all my smaller compositions. How can I overcome this huge obstacle and actually write a symphony? One thing that often can help with being lost in possibilities is to try to limit oneself. In fact, this helps in life as well. For example, maybe you want to write an essay about a traumatic experience, but don't know what to say. To limit oneself, maybe start with just one moment of the experience. Anyway, I suggest starting small: Picking one idea, one motif, or maybe one restriction (a great example is that classical piano piece that only uses chord tones throughout), and developing it until you have a full-length symphony. By artificially narrowing the possibilities, you end up exploring a whole new set of possibilities. Burden of choice. This is a classic problem for creative people. You can’t choose because there are simply too many choices. To fix this, give yourself creative boundaries that you can push against; articulate what the piece isn’t / what you don’t want / impose arbitrary boundaries. You can always change them, but you need to start with them. 3 ways people often write orchestral music: full score, short score, and piano score. For you it might make the most sense to start with a piano score, write the music, and then do your orchestration. Many of your questions / confusion seem to be Orchestration related and not composition related. So, why paralyze yourself before you begin? Create now, refine later. PS Beethoven was a rough orchestrator and may not be the most wonderful model to aspire to. Not the answer you're looking for? Browse other questions tagged composition harmony melody orchestra timbre or ask your own question.